Is there an iPad killer out there? It's a question that has fueled endless debate among gadget nerds, all of which has been a tad premature: in the six months since Apple started shipping its tablet, no other major manufacturer released anything even vaguely similar, let alone superior. Starting this month, the iPad has company. The chances of Samsung's new Galaxy Tab spelling doom for Steve Jobs' brainchild are zero, in part because the experience it delivers is nowhere near as polished and complete. 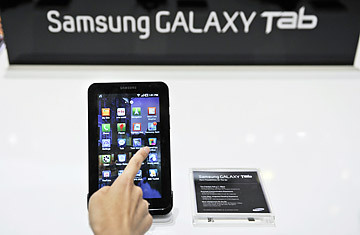 Still, this gizmo, powered by Google's Android operating system, offers tablet shoppers a genuine choice, not an echo. In multiple major areas where Apple zigged, Samsung has chosen to zag, rendering the Tab less of an iPad wannabe than an anti-iPad. Unlike the notoriously camera-free iPad, the Tab sports cameras fore and aft, including a 1.3-megapixel model on the front for video chats and a ho-hum three-megapixel one with flash on the back. I don't consider them huge points in its favor: you'll get funny looks if you brandish the tablet like a point-and-shoot camera to snap a photo or capture video, and the iPhone 4's FaceTime video-calling software is sorely missed. Softwarewise, the Tab behaves like an oversize Android phone that lets you do just about anything except make phone calls. Its Web browser stacks up well against the iPad's, and can play the Adobe Flash videos that remain banned from Apple devices. Gallery, the photo viewer, lets you show off albums whether they reside on the tablet or on Google's Picasa Web Albums service. The Sprint Tab I used also came preloaded with Amazon's Kindle e-reader software, turning it into a serviceable e-reader. As I tapped my way around and bopped between programs, the 1-GHz processor and 512 MB of RAM gave almost everything a zippy, responsive feel, although scrolling was sometimes choppier than it is on the iPad. Of course, the iPad is about more than zippy responsiveness and fluid scrolling  it benefits enormously from the bundled Apple software and thousands of third-party applications that were written just for it. Samsung has tweaked a few of the Tab's apps to take advantage of the 7-in. display: the calendar, for example, has a nifty month-at-a-glance view that wouldn't fit on a puny phone screen. But most of the preinstalled programs  and all the 100,000-plus available on the Android Market  haven't been reimagined for tablet use. They're just smart-phone apps on a larger canvas. And a few I tried, including USA Today, appeared in a window surrounded by a fat black border. Among the few icons that sit directly on the Tab's desktop is a tempting Free Games! one planted there by Sprint. I tapped it and downloaded a golf demo. When I tried to install the app, I got warnings about the security risks posed by programs procured anywhere but at Google's Android Market. How a nongeek is supposed to react to such passive-aggressive behavior, I'm not sure. Some of the Tab's rough edges stem from the fact that it uses Android 2.2, a version that wasn't designed with iPad-style devices in mind. Rumor has it that an upcoming version of the operating system, code-named Honeycomb, will be the first truly tablet-friendly edition; when it's ready, expect a profusion of new Android tablets and more software that takes full advantage of them. In other words, even if the Galaxy Tab doesn't give Apple's tablet so much as a flesh wound, you can bet that the hunt for an iPad killer will go on. McCracken blogs about personal technology at Technologizer, which he founded in 2008 after nearly two decades as a tech journalist. His column for TIME.com, also called Technologizer, appears every Tuesday. Get the latest gadget news and reviews at Techland.com.